to be alone with death. The other day, searching for something else, I came across the following essay I wrote for The Threepenny Review twenty-three years ago (Winter 1994 edition). The pages are now the yellow tint of an old man’s teeth, and they turn with an arthritic, archival resistance, sort of saying, Why are you bothering us? Leave us alone. This is the past. But I thought I would retype and share it anyway, reprint it verbatim. It was written in Samoa, after a dozen years there, on one of my first word processors (as they were then called). I still have the same dictionary open beside me. I was brushing out my American Heritage Dictionary of the English Language tonight (first edition, 1969). It was interesting to see which pages had the most dust balls and dead bugs in the cracks between them. It would seem from the evidence that I stall as a speller at predictable places. Twenty-some years ago I was hired as a textbook editor at Prentice Hall, my first real editing job. In spite of my M.A., I just barely passed the spelling test. 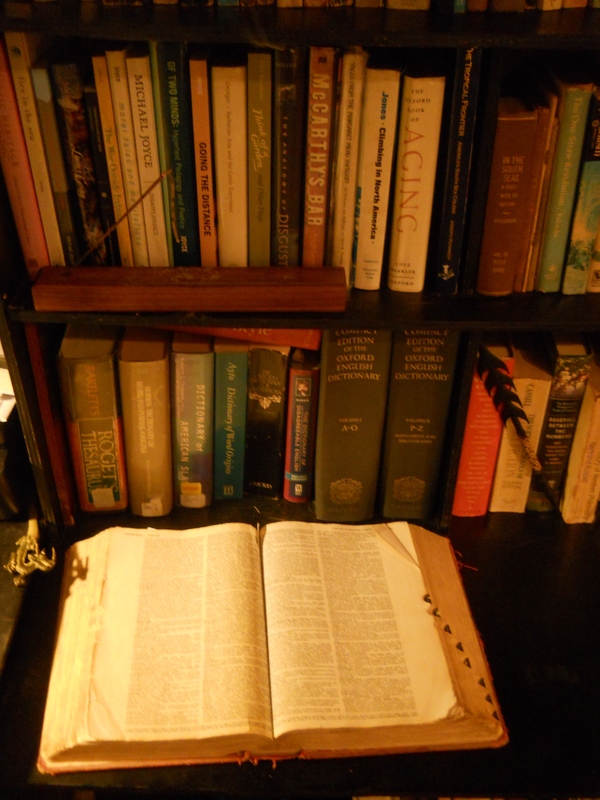 The guy that hired me made me promise that I would keep a dictionary open on my desk at all times. He would check. I did. He did. I left that job after a year or so, but I have had the same dictionary open on my desk ever since, flipped open to whatever page I last consulted. I guess the books you refer to most often are called reference works. The books that are always in the same place when you reach out for them, ready to hand, discernable by touch. The books you take most for granted. The books no one else in the house or the office would dare remove. The books that have moved with you when most everything else was left behind. This is nothing like having a spell checker on your hard disk. For instance, earlier this evening I looked up the word eavesdropper even though I was ninety-five percent sure of my spelling, because when I was writing the word out it had seemed so suggestive. A spell checker would have skipped right over it. I ended up reading the history of its Indo-European root “upo” in an appendix, which got me thinking about the Samoan word upu (which means “word”), then looking that up and following its varying meanings through different grammatical forms. Then the phone rang. That’s part of the magic of reference works. My American Heritage can give me a one-sentence definition of Orpheus, but an even denser reference book, Robert Graves’s two-volume Greek Myths, can give me enough information to confuse me, make Orpheus lifelike, and send me off to the porch for a smoke and a stroll. What else? The OED, Roget’s, Schultz’s Samoan Proverbial Expressions, the King James version of the Bible, Pound’s Personae, Milner’s Samoan Dictionary, Yeats, Buck’s Samoan Material Culture. Everyone has their own, highly personalized list. And the list changes with time as well. Since I have moved to Samoa, my Peterson’s Guide to Western Birds and Mencken’s The American Language have moved up a few shelves, out of immediate reach. I once had a scheme—while still an undergrad in East Harlem—of translating The Dream Book into Spanish: an ultimate reference work for the neighborhood. Every morning when you passed the newsstand at the head of the subway stairs, one top issue of the Daily News would be turned over to the racing news page so that numbers players could check the final three digits of yesterday’s handle at the track to see if they held winning numbers. The guy who ran the newsstand did this as a public service, because otherwise every morning one third of the crowd going down the stairs to work would have been non-paying customers just thumbing through the top-of-the-pile Daily News looking for yesterday’s track attendance, ruining the merchandise. The Dream Book was an ingenious product, but it was out only in English (and totally unprotected by copyright). What the thin Dream Book did was alphabetically translate your dreams into a three-digit number. Say you had dreamed of basketballs, you just looked it up under B and there in the parallel column was your number to bet for the day. No preface, no justifications, no footnotes, no author even, and no coins to toss or cards to relate to one another. Just look it up—as in a phonebook—and bet it. I dreamed of ducks in flight—374. I could have sold 10,000 copies of a Spanish edition, very cheaply made. There was a need: so many ready Spanish-speaking reference-work customers out there. It never happened for some reason. I think I tried to ethnically edit it. Have you ever ripped a page out of the phonebook in a public telephone booth just because you did not have either a pen or a spare piece of paper to write the number down on? And don’t you still feel a little bit antsy, too over-controlled, like some kid in study hall, when you are forced to consult some library’s sit-here-and-read-it reference work? Don’t you really want just to take it home for a day or two? The other day I received an advertisement for the most-advanced-yet computer software package on the Bible: indices, commentaries, illustrations, a freshly translated “contemporary” text, a wholly new and user-friendly Old and New Testament. Now, nothing in the Bible was meant to make any kind of real sense—at best it is flashes of insight embedded in fields of blather—but it is fun to read now and then, and it is one of the core books most people in my cultural/historical lineage claim to defer to. A deference work more than a reference work, really—something to know about. I could not imagine a single reason why I would wish to supplant my ragged, taped together King James version with this Super Mario Brothers creation. A tragic thing here in the equatorial zone: the books you touch the most die fastest. The oil in the sweat of your palms, tropic microbes, a Petri dish climate. Covers and bindings go organic; so that the books you consult the most become the most damaged, most bandaged. And the oldest die first, mimicking life. Ezra Pound once wrote, “Culture is when you forget which book.” How many times must I check the spelling of paideuma before I arrive there?